Fluttering Butterflies: Happy 3rd birthday, Fluttering Butterflies! Happy 3rd birthday, Fluttering Butterflies! Today marks the third anniversary for my little blog! Happy blogiversary to me! I started this blog three years ago, just a few months after my oldest son Elliot was born. I needed some .. proof, let's say, that I wasn't just a mother. That my whole life, including all my thoughts and feelings, hadn't shifted into motherhood and got lost there. I wanted to prove that I was still interested in books and movies and television. I still needed to work through my own issues with motherhood and leaving America. Today, this blog has transformed into something I wouldn't have even imagined three years ago. It's been difficult to find my place with this blog. I write about my children, but I'm not a mommy blogger. I write about the books I read, but in no way am I a book blogger. I live in another country from the one I was born, but I wouldn't consider myself an expat blogger. I think that having no specific audience to write for, I've struggled. But at least it hasn't been in vain. According to Google Reader, I have 25 subscribers (eep! I just checked and it's since jumped to *39* subscribers!) and write 5.8 posts a week. 17 people have followed me on Blogger. At one point in my life, I might not have been happy with those modest figures, especially compared to other websites I visit. But I am happy. I get a steady stream of comments, I'm involving myself in interesting conversations with good people, I feel part of a community. So thank you all. For making me feel welcome, for the comments, for including me. Happy Blogiversary. You are right that sometimes it can be hard to figure out what kind of blogger you are! Keep up the good work though. I'm so happy we "met"
Happy 3rd blogavirasary!! Has it really been that long? Seems like just yesterday we found each other again and what not.. I shall now boost my count by one! Happy 3rd blogiversary to you! And let's hear it for diversity in blog content; like you, I blog about my books, my family, and whatever else comes to mind. Our blogs are our space, so we shouldn't feel confined to one niche unless that's really what we want. Keep it up :-)! Happy blog birthday - love to read it every day. 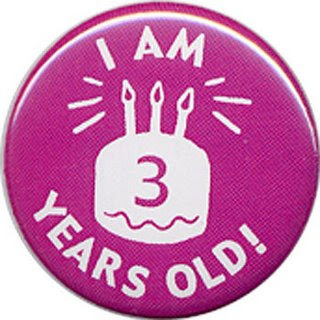 Happy 3rd blogoversary! I think your reason for starting the blog is awesome. I don't have kids yet but am thinking about it, and that's always something I worry about. Good to see a fabulous blogger who's a mom without being a mommy blogger! Happy Blogiversary! Here's to many more!